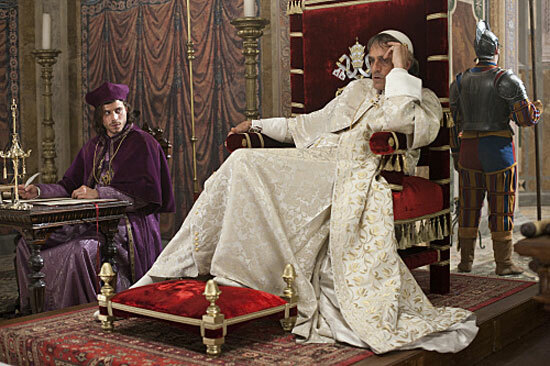 The Pope plotting with Cesare. The show also includes the infamous Lucrezia Borgia. Played by Holliday Grainger, she is first shown as young teenager, unspoilt and lovely. She befriends her father's new mistress, Guilia Farnese, and begins to learn what her role in life will be - someone with little power unless she uses her beauty and wit to her best advantage. Lucrezia's mother Vanozza makes up the third in this triangle of women. She portrays Rodrigo's former mistress and mother of his children, cast over by him once he became Pope. The casting here is excellent; Grainger successfully conveys innocence, followed by a growing awareness of her effect on men and capacity for manipulation, and Lotte Verbeek plays Guilia with the kind of guarded awareness and restraint you'd expect from a woman in her position. Johanne Whalley plays Vanozza, and the moments between the three of them are mined with the underlying subtext of the bitterly limited options women had open to them in their lives. Men held all the power, and women were lucky if they were loved enough or pretty enough to be spoken to. 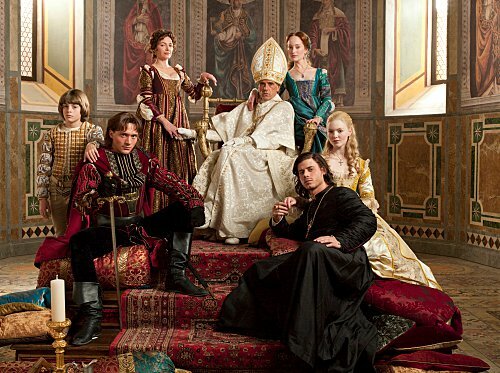 Even when they were loved, it was dicey; Lucrezia is bargained off at 14, sold into marriage as part of a larger plan to consolidate Rodrigo's power against threat of a French invasion. The Pope, getting a headache from his Cardinals. 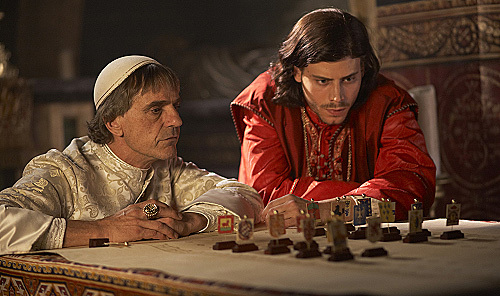 Cesare and Micheletto, negotiating their friendship. Within the family, Cesare and his brother, Juan, clash frequently, most often because of the careers Rodrigo assigned to them. Cesare would rather be in the army than the clergy, and Juan takes his soldierly duties too lightly but refuses to listen when anyone points this out. The children's illegitimacy is sometimes an issue, and Rodrigo's 'lewdness' is a major factor in the arguments against him as a Pope. 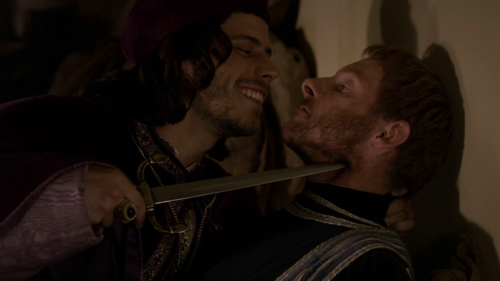 Then there's the way everyone sleeps around, and the way Cesare occasionally organises a murder. While I have no idea if this is a realistic portrayal of this infamous family, it all makes for very intriguing TV. The politics of 15th century Italy are a primary driver for much of what happens, as the Vatican was a huge seat of power in an unintegrated land. Italy of the time was divided into many principalities, all with a variety of rulers, and the security of Borgia's reign depended greatly on his ability to secure allegiances with the great houses - the Medicis in Florence, the Sforzas in the north in Milan and east near Forli, the rulers of Naples, and so on. Rodrigo marries Lucrezia off to the Sforzas and opens communication with Florence, Milan and Naples, but someone else seeks alliances with the major houses - Cardinal della Rovere, played by Colm Feore, whom Borgia defeated in the competition for Pope. He has become determined to see Borgia deposed, and it becomes a race to determine whether Borgia (and Cesare, and Micholetto) can secure his Papacy before della Rovere returns. I won't tell you how it ends, or give away the many and varied storylines and intrigues I haven't mentioned. You'll just have to get hold of a copy of season 1, and see for yourself. As for me, I can't wait to start watching season 2. Well? Do you think you could take them on?